Lamotrigine , marketed in most of the world as Lamictal by GlaxoSmithKline, is an anticonvulsant drug used in the treatment of epilepsy and bipolar disorder. It is also used off-label as an adjunct in treating clinical depression. For epilepsy, it is used to treat focal seizures, primary and secondary tonic-clonic seizures, and seizures associated with Lennox-Gastaut syndrome. Like many other anticonvulsant medications, lamotrigine also seems to act as an effective mood stabilizer, and has been the first US Food and Drug Administration (FDA)-approved drug for this purpose since lithium, a drug approved almost 30 years earlier. It is approved for the maintenance treatment of bipolar type I. Chemically unrelated to other anticonvulsants (due to lamotrigine being a phenyltriazine), lamotrigine has many possible side-effects. Lamotrigine is generally accepted to be a member of the sodium channel blocking class of antiepileptic drugs, but it could have additional actions since it has a broader spectrum of action than other sodium channel antiepileptic drugs such as phenytoin and carbamazepine and is effective in the treatment of the depressed phase of bipolar disorder, whereas other sodium channel blocking antiepileptic drugs are not. In addition, lamotrigine shares few side-effects with other, unrelated anticonvulsants known to inhibit sodium channels, which further emphasises its unique properties. Lamotrigine is inactivated by glucuronidation in the liver. Lamotrigine was developed in 1994. Lamotrigine is approved in the US for the treatment of partial seizures. It is considered a first-line drug for primary generalised tonic-clonic seizures (includes simple partial, complex partial and secondarily generalised seizures), and as an adjuvant therapy in partial seizures (focal onset tonic-clonic, atypical absence, myoclonic, and due to Lennox-Gastaut syndrome). As well, it is used as an alternative drug for absence seizure and atypical absence, myoclonic, and atonic seizures. Lamotrigine is one of a small number of FDA-approved therapies for seizures associated with Lennox-Gastaut syndrome, a severe form of epilepsy. Typically developing before four years of age, LGS is associated with developmental delays. There is no cure, treatment is often complicated, and complete recovery is rare. Symptoms include the atonic seizure (also known as a "drop attack"), during which brief loss of muscle tone and consciousness cause abrupt falls. Lamotrigine significantly reduces the frequency of LGS seizures, and is one of two medications known to decrease the severity of drop attacks. Combination with valproate is common, but this increases the risk of lamotrigine-induced rash, and necessitates reduced dosing due to the interaction of these drugs. Lamotrigine is approved in the US for maintenance treatment of bipolar I disorder. While traditional anticonvulsant drugs are predominantly antimanics, lamotrigine is most effective for preventing the recurrent depressive episodes of bipolar disorder. The drug seems ineffective in the maintenance of current rapid-cycling, acute mania, or acute depression in bipolar disorder; however, it is effective at prevention of or delaying the mania, depressive, or rapid cycle. According to studies in 2007, lamotrigine may treat bipolar depression without triggering mania, hypomania, mixed states, or rapid-cycling. There is less evidence of therapeutic benefit when lamotrigine is used to treat a current mood episode. It has not demonstrated effectiveness in treating acute mania, and there is controversy regarding the drug’s effectiveness in treating acute bipolar depression. While the 2002 American Psychiatric Association (APA) guidelines recommend lamotrigine as a first-line treatment for acute depression in Bipolar II disorder, the APA’s website notes that the guidelines, being more than five years old, “can no longer be assumed to be current". A paper written in 2008 by Nasser et al. reviewed evidence from trials that were unpublished and not referenced in the 2002 APA guidelines, and it concludes that lamotrigine has "very limited, if any, efficacy in the treatment of acute bipolar depression". A 2008 paper by Calabrese et al. examined much of the same data, and found that in five placebo-controlled studies, lamotrigine did not significantly differ from placebo in the treatment of bipolar depression. However, in a meta-analysis of these studies conducted in 2008, Calabrese found that lamotrigine was effective in individuals with bipolar depression, with a number needed to treat (NNT) of 11, or 7 in severe depression. A 2013 review about lamotrigine concluded that it is recommended in bipolar maintenance when depression is prominent and that more research is needed in regards to its role in the treatment of acute bipolar depression and unipolar depression. As well, no information to recommend its use in other psychiatric disorders was found. Off-label uses include the treatment of peripheral neuropathy, trigeminal neuralgia, cluster headaches, migraines, and reducing neuropathic pain. Off-label psychiatric usage includes the treatment of depersonalization disorder, hallucinogen persisting perception disorder, schizoaffective disorder, borderline personality disorder, and post-traumatic stress disorder. Lamotrigine has been studied as an adjunctive therapy for treatment of refractory unipolar depression, attaining efficacy on the secondary metric for treatment outcomes (Clinical Global Impressions), but not the primary metrics (Montgomery-Åsberg Depression Rating Scale and Hamilton Rating Scale for Depression). Lamotrigine has also been found to have a role in the treatment of adult attention deficit hyperactivity disorder with comorbid depression. It is also appropriate for the treatment of Lennox-Gastaut syndrome. Lamotrigine prescribing information has a black box warning about life-threatening skin reactions, including Stevens–Johnson syndrome, DRESS syndrome and toxic epidermal necrolysis. The manufacturer states that nearly all cases appear in the first two to eight weeks of therapy, or if the medication is suddenly stopped then resumed at the normal dosage. Patients should seek medical attention for any unexpected skin rash, as its presence is an indication of a possible serious or even deadly side-effect of the drug. Not all rashes that occur while taking lamotrigine progress to SJS or TEN. Between 5 to 10% of patients will develop a rash, but only one in a thousand patients will develop a serious rash. Rash and other skin reactions are more common in children, so this medication is often reserved for adults. For patients whose lamotrigine has been stopped after development of a rash, re-challenge with lamotrigine is also a viable option. However, it is not applicable for very serious cases. There is also an increased incidence of these eruptions in patients who are currently on, or recently discontinued a valproate-type anticonvulsant drug, as these medications interact in such a way that the clearance of both is decreased and the effective dose of lamotrigine is increased. Side-effects such as rash, fever, and fatigue are very serious, as they may indicate incipient Stevens–Johnson syndrome, toxic epidermal necrolysis, DRESS syndrome or aseptic meningitis. Other side-effects include loss of balance or coordination; double vision; crossed eyes; pupil constriction; blurred vision; dizziness and lack of coordination; drowsiness, insomnia; anxiety; vivid dreams or nightmares; dry mouth, mouth ulcers; memory and cognitive problems; mood changes; runny nose; cough; nausea, indigestion, abdominal pain, weight loss; missed or painful menstrual periods; and vaginitis. The side-effect profile varies for different patient populations. Overall adverse effects in treatment are similar between men, women, geriatric, pediatric and racial groups. Lamotrigine has been associated with a decrease in white blood cell count (leukopenia). Lamotrigine does not prolong QT/QTc in TQT studies in healthy subjects. In clinical trials women were more likely than men to have side-effects. This is the opposite of most other anticonvulsants. There is evidence showing interactions between lamotrigine and female hormones, which can be of particular concern for women on estrogen-containing hormonal contraceptives. Ethinyl estradiol, the ingredient of such contraceptives, has been shown to decrease serum levels of lamotrigine. Women starting an estrogen-containing oral contraceptive may need to increase the dosage of lamotrigine to maintain its level of efficacy. Likewise, women may experience an increase in lamotrigine side-effects upon discontinuation of the pill. This may include the "pill-free" week where lamotrigine serum levels have been shown to increase twofold. Another study showed a significant increase in follicle stimulating hormone (FSH) and luteinizing hormone (LH) in women taking lamotrigine with oral contraceptive compared to women taking oral contraceptives alone. However, these increases were not in conjunction with increased progesterone, indicating that oral contraceptives maintained suppression of ovulation. Lamotrigine is rated Pregnancy Category Risk C. Use during pregnancy is recommended only if benefits outweigh potential risks. In September 2006, the FDA issued a warning stating that taking lamotrigine during the first trimester of pregnancy may increase the risk for cleft lip and palate malformation in newborns. Since then, review studies have found that overall rates of congenital malformations in infants exposed to lamotrigine in utero are relatively low (1-4%). This compares to a typical 3% rate in the untreated population. A prospective study on cognition in children (mean age = 4.2 years) exposed to lamotrigine in utero did not indicate any adverse effects. Lamotrigine is expressed in breast milk; the manufacturer does not recommend breastfeeding during treatment. In "Medications and Mothers' Milk," a frequently updated review of scientific literature, lamotrigine is rated as L3: moderately safe. Lamotrigine binds to melanin-containing tissues such as the iris of the eye. The long-term consequences of this are unknown. Some patients have reported experiencing a loss of concentration, even with very small doses. Lamotrigine has been implicated in the apoptotic neurodegeneration of the developing brain. GlaxoSmithKline investigated lamotrigine for the treatment of ADHD with inconclusive results. No detrimental effects on cognitive function were observed; however, the only statistical improvement in core ADHD symptoms was an improvement on a test, PASAT (Paced Auditory Serial Addition Test), that measures auditory processing speed and calculation ability. Another study reported that lamotrigine might be a safe and effective treatment option for adult ADHD comorbid with bipolar and recurrent depression. Lamotrigine is known to affect sleep. Studies with small numbers (10-15) of patients reported that lamotrigine increases sleep stability (increases the duration of REM sleep, decreases the number of phase shifts and decreases the duration of slow-wave sleep), and that there was no effect on vigilance, and daytime somnolence and cognitive function. However, a retrospective study of 109 patients' medical records found that 6.7% of patients experienced an "alerting effect" resulting in intolerable insomnia, for which the treatment had to be discontinued. Lamotrigine can induce a type of seizure known as a myoclonic jerk, which tends to happen soon after the use of the medication. When used in the treatment of myoclonic epilepsies such as juvenile myoclonic epilepsy, lower doses (and lower plasma levels) are usually needed, as even moderate doses of this drug can induce seizures, including tonic-clonic seizures, which can develop into status epilepticus, which is a medical emergency. It can also cause myoclonic status epilepticus. In overdose, lamotrigine can cause uncontrolled seizures in most people. Reported results in overdoses involving up to 15 g include increased seizures, coma and death. Lamotrigine is a member of the sodium channel blocking class of antiepileptic drugs. It is a triazine derivate that inhibits voltage-sensitive sodium channels, leading to stabilization of neuronal membranes. It also blocks L-, N-, and P-type calcium channels and has weak 5-hydroxytryptamine-3 (5-HT3) receptor inhibition. These actions are thought to inhibit release of glutamate at cortical projections in the ventral striatum limbic areas, and it has been pointed out this neuroprotective and antiglutamatergic effects as promising contributors to its mood stabilizing activity. Observations that lamotrigine reduced γ-aminobutyric acid (GABA) A receptor-mediated neurotransmission in rat amygdala, suggest that a GABAergic mechanism may also be involved, although this concept is controversial. Lamotrigine does not have pronounced effects on any of the usual neurotransmitter receptors (adrenergic, dopamine D1 and D2, muscarinic, GABA, histaminergic H1, serotonin 5-HT2, and N-methyl-D-asparate). Inhibitory effects on 5-HT, norepinephrine, and dopamine transporters are weak. Lamotrigine is a weak inhibitor of dihydrofolate reductase, but whether this effect is sufficient to contribute to a mechanism of action or increases risk to the fetus during pregnancy is not known. Early studies of lamotrigine's mechanism of action examined its effects on the release of endogenous amino acids from rat cerebral cortex slices in vitro. As is the case for antiepileptic drugs that act on voltage-dependent sodium channels, lamotrigine inhibited the release of glutamate and aspartate evoked by the sodium-channel activator veratrine and was less effective in the inhibition of acetylcholine or GABA release. At high concentrations, it had no effect on spontaneous or potassium evoked amino acid release. The basis for this broader spectrum of activity of lamotrigine is unknown, but could relate to actions of the drug on voltage-activated calcium channels. Lamotrigine blocks T-type calcium channels weakly, if at all. However, it does inhibit native and recombinant high-voltage–activated calcium channels (N- and P/Q/R-types) at therapeutic concentrations. Whether this activity on calcium channels accounts for lamotrigine's broader clinical spectrum of activity in comparison with phenytoin and carbamazepine remains to be determined. The pharmacokinetics of lamotrigine follow first-order kinetics, with a half-life of 13.5 hours and volume of distribution of 1.36 L/kg. Lamotrigine is rapidly and completely absorbed after oral administration. Its absolute bioavailability is 98% and its plasma Cmax occurs from 1.4 to 4.8 hours. Available data indicate that its bioavailability is not affected by food. Estimate of the mean apparent volume of distribution of lamotrigine following oral administration ranges from 0.9 to 1.3 L/kg. This is independent of dose and is similar following single and multiple doses in both patients with epilepsy and in healthy volunteers. Lamotrigine is metabolised predominantly by glucuronic acid conjugation. Its major metabolite is an inactive 2-n-glucuronide conjugate. Lamotrigine has fewer drug interactions than many anticonvulsant drugs, although pharmacokinetic interactions with carbamazepine, phenytoin and other hepatic enzyme inducing medications may shorten half-life. Dose adjustments should be made on clinical response, but monitoring may be of benefit in assessing compliance. December 1994 — Lamotrigine was approved for the treatment of partial seizures. December 1998 — for use as monotherapy for treatment of partial seizures in adult patients when converting from a single enzyme-inducing anti-epileptic drug (EIAED). June 2003 — approved for maintenance treatment of Bipolar I disorder; the first such medication since lithium. January 2004 — for use as monotherapy for treatment of partial seizures in adult patients when converting from the anti-epileptic drug valproate [including valproic acid (Depakene); sodium valproate (Epilim) and divalproex sodium (Depakote)]. GlaxoSmithKline's trademarked brand of lamotrigine, Lamictal, is manufactured in scored tablets (25 mg, 50 mg, 100 mg, 150 mg and 200 mg) and chewable dispersible tablets (2 mg, 5 mg and 25 mg). Five-week sample kits are also available; these include titration  instructions and scored tablets (25 mg for patients taking valproate, 25 mg and 100 mg for patients not taking valproate). Lamotrigine is also available in un-scored tablet form. In 2005, Teva Pharmaceutical Industries Ltd. began selling generic lamotrigine in the United States, but only in 5 mg and 25 mg chewable dispersible tablets. On 23 July 2008, Teva began offering the full line of generic lamotrigine in the US. Lamotrigine is also available in generic form in the United States, the United Kingdom, Canada and Australia. It should be noted that brand name Lamictal is not available in 200 mg tablets in Canada, at all registered pharmacies (while 25, 100, and 150 mg are all offered). Starter kits are also not available in Canada. Lamotrigine is marketed as Lamotrine in Egypt, Lamitrin in Bangladesh, Lamictin in South Africa, למוג'ין (Lamogine) in Israel, and 라믹탈 in South Korea and generally named as Lamitor. 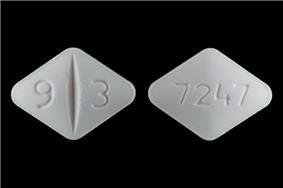 In 2009 GlaxoSmithKline received FDA Approval for an extended-release version of lamotrigine branded Lamictal XR. 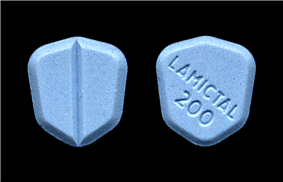 Lamictal XR tablets are a novel preparation of lamotrigine, delivered in a tablet with an enteric coating that GlaxoSmithKline has branded DiffCORE. The extended release formulation is analogous to the instant release version, such that treatment may begin without titration or recalibration of the dosage. ^ a b Barbosa L, Berk M, Vorster M (April 2003). "A double-blind, randomised, placebo-controlled trial of augmentation with lamotrigine or placebo in patients concomitantly treated with fluoxetine for resistant major depressive episodes" (PDF). J Clin Psychiatry 64 (4): 403–7. ^ Rogawski MA, Löscher W (July 2004). "The neurobiology of antiepileptic drugs". Nat Rev Neurosci 5 (7): 553–564. ^ Lees G, Leach MJ (May 1993). "Studies on the mechanism of action of the novel anticonvulsant lamotrigine (Lamictal) using primary neurological cultures from rat cortex". Brain Research 612 (1–2): 190–9. ^ Werz MA (October 2008). "Pharmacotherapeutics of epilepsy: use of lamotrigine and expectations for lamotrigine extended release". Ther Clin Risk Manag 4 (5): 1035–46. ^ a b anonymous (19 March 2004). "EFFICACY SUPPLEMENTS APPROVED IN CALENDAR YEAR 2003". FDA/Center for Drug Evaluation and Research. Retrieved 2008-04-09. ^ Kasper, D (2005). Fauci AS, Braunwald E; et al., eds. eds. Harrison’s Principles of Internal Medicine, 16th ed. McGraw-Hill. pp. 3–22. ^ Tierny, LM Jr (2006). McPhee SJ, Papadakis MA, ed. Current Medical Diagnosis and Treatment, 45th ed. McGraw-Hill. ^ French JA, Kanner AM, Bautista J, et al. (April 2004). "Efficacy and tolerability of the new antiepileptic drugs II: treatment of refractory epilepsy: report of the Therapeutics and Technology Assessment Subcommittee and Quality Standards Subcommittee of the American Academy of Neurology and the American Epilepsy Society". Neurology 62 (8): 1261–73. ^ Pellock JM (November 1999). "Managing pediatric epilepsy syndromes with new antiepileptic drugs". Pediatrics 104 (5 Pt 1): 1106–16. ^ a b Ghaemi, S.N., Shirzadi, A.A., Filkowski, M. (2008). "Publication Bias and the Pharmaceutical Industry: The Case of Lamotrigine in Bipolar Disorder". Medscape J Med 10 (9): 211. ^ Goldberg JF, Calabrese JR, Saville BR, Frye MA, Ketter TA, Suppes T, Post RM, Goodwin FK. (2009). "Mood stabilization and destabilization during acute and continuation phase treatment for bipolar I disorder with lamotrigine or placebo". Clinical Psychiatry 70 (9): 1273–80. ^ Goldsmith DR, Wagstaff AJ, Ibbotson T, Perry CM (2003). "Lamotrigine: a review of its use in bipolar disorder". Drugs 63 (19): 2029–50. ^ Geddes JR (May 2011). "Treatment of bipolar disorder". Lancet 11 (9878): 1672–82. ^ Calabrese JR, Huffman RF, White RL, Edwards S, Thompson TR, Ascher JA, Monaghan ET, Leadbetter RA (2008). "Lamotrigine in the acute treatment of bipolar depression: results of five double-blind, placebo-controlled clinical trials". Bipolar disorders 10 (2): 323–333. ^ Calabrese JR, Geddes JR, Goodwin GM (2009). "Lamotrigine for treatment of bipolar depression: independent meta-analysis and meta-regression of individual patient data from five randomised trials". British Journal of Psychiatry 194 (1): 4–9. ^ Reid, JG; Gitlin MJ; Altshuler LL (July 2013). "Lamotrigine in psychiatric disorders". J Clin Psychiatry 74 (7): 675–84. ^ Backonja M (June 2004). "Neuromodulating drugs for the symptomatic treatment of neuropathic pain". Curr Pain Headache Rep 8 (3): 212–6. ^ Jensen, T. S. (2002). "Anticonvulsants in neuropathic pain: Rationale and clinical evidence". European Journal of Pain 6: 61–68. ^ Pappagallo M (October 2003). "Newer antiepileptic drugs: possible uses in the treatment of neuropathic pain and migraine". Clin Ther 25 (10): 2506–38. ^ Medford, N. (2005). "Understanding and treating depersonalisation disorder". Advances in Psychiatric Treatment 11 (2): 92–100. ^ Hermle, L.; Simon, M.; Ruchsow, M.; Geppert, M. (2012). "Hallucinogen-persisting perception disorder". Therapeutic Advances in Psychopharmacology 2 (5): 199–205. ^ Erfurth, A.; Walden, J. O. R.; Grunze, H. (1998). "Lamotrigine in the Treatment of Schizoaffective Disorder". Neuropsychobiology 38 (3): 204–205. ^ Lieb, K.; Völlm, B.; Rücker, G.; Timmer, A.; Stoffers, J. M. (2009). "Pharmacotherapy for borderline personality disorder: Cochrane systematic review of randomised trials". The British Journal of Psychiatry 196 (1): 4–12. ^ Stein, D. J.; Zungu-Dirwayi, N.; Van Der Linden, G. J. H.; Seedat, S. (2000). Stein, Dan, ed. "Pharmacotherapy for post traumatic stress disorder (PTSD)". The Cochrane Library. ^ Öncü, B; Er, O; Çolak, B; Nutt, DJ (Mar 2014). "Lamotrigine for attention deficit-hyperactivity disorder comorbid with mood disorders: a case series.". Journal of psychopharmacology (Oxford, England) 28 (3): 282–3. ^ Hancock EC, Cross JH. (2013). "Treatment of Lennox-Gastaut syndrome.". Cochrane Database of Systematic Reviews (2). ^ Serrani Azcurra, DJ (Jun 2012). "Lamotrigine rechallenge after a skin rash. A combined study of open cases and a meta-analysis.". Revista de psiquiatria y salud mental 6 (4): 144–9. ^ a b c unknown, unknown. National Institute of Health http://dailymed.nlm.nih.gov/dailymed/lookup.cfm?setid=d7e3572d-56fe-4727-2bb4-013ccca22678#nlm34070-3. Retrieved 8 May 2014. ^ Lamotrigine does not prolong QTc in a thorough QT/QTc study in healthy subjects Dixon, Ruth; Job, S., Oliver, R., Tompson, D., Wright, J. G., Maltby, K., Lorch, U. and Taubel, J. (2008). (July 2008). "Lamotrigine does not prolong QTc in a thorough QT/QTc study in healthy subjects". Br J Clin Pharmacol 2008 66 (3): 396–404. ^ Motomura, E; Tanii, H; Usami, A; Ohoyama, K; Nakagawa, M; Okada, M (March 2012). "Lamotrigine-Induced Neuroleptic Malignant Syndrome Under Risperidone Treatment: A Case Report". The Journal of Neuropsychiatry and Clinical Neurosciences 24 (2): E38-E39. ^ Ishioka, M; Yasui-Furukori, N; Hashimoto, K; Sugawara, N (July–August 2013). "Neuroleptic malignant syndrome induced by lamotrigine.". Clinical Neuropharmacology 36 (4): 131–132. ^ Reimers A, A; Helde G; Brodtkorb E (September 2005). "Ethinyl estradiol, not progestogens, reduces lamotrigine serum concentrations". Epilepsia (Blackwell Science) 46 (9): 1414–7. ^ a b Sidhu J, J; Job S; Singh S; Philipson R (February 2006). "The pharmacokinetic and pharmacodynamic consequences of the co-administration of lamotrigine and a combined oral contraceptive in healthy female subjects". Br J Clin Pharmacol. 61 (2): 191–9. ^ Berwaerts, K; Sienaert P; De Fruyt J (2009). "Teratogenic effects of lamotrigine in women with bipolar disorder". Tijdschr Psychiatr (in Dutch) 51 (10): 741–50. ^ Prakash; Prabhu LV; Nasar MA; et al. (October 2007). "Lamotrigine in pregnancy: safety profile and the risk of malformations". Singapore Med J 48 (10): 880–3. ^ McVearry, KM; Gaillard WD; VanMeter J; Meador KJ (December 2009). "A prospective study of cognitive fluency and originality in children exposed in utero to carbamazepine, lamotrigine, or valproate monotherapy". Epilepsy Behav 16 (4): 609–16. ^ Hale, TW (2008). Medications and Mothers' Milk (13th ed.). Hale Publishing. p. 532. ^ anonymous. "Lamictal, Warnings & Precautions". RxList Inc. Retrieved 2008-04-09. ^ Oncü B, Er O, Colak B, Nutt DJ (2014). "Lamotrigine for attention deficit-hyperactivity disorder comorbid with mood disorders: a case series.". J Psychopharmacol 28 (3): 282–3. ^ Foldvary, N; Perry M; Lee J; et al. (December 2001). "The effects of lamotrigine on sleep in patients with epilepsy". Epilepsia 42 (12): 1569–73. ^ Bonanni, E; Galli R; Gori S; et al. (June 2001). "Neurophysiological evaluation of vigilance in epileptic patients on monotherapy with lamotrigine". Clin Neurophysiol 112 (6): 1018–22. ^ Sadler, M (March 1999). "Lamotrigine associated with insomnia". Epilepsia 40 (3): 322–5. ^ Rogawski, M (2002). "Chapter 1: Principles of antiepileptic drug action". In Levy RH, Mattson RH, Meldrum BS, Perucca E. Antiepileptic Drugs, Fifth Edition. Lippincott Williams & Wilkins. pp. 3–22. ^ Thomas, SP; Nandhra HS; Jayaraman A (April 2010). "Systematic review of lamotrigine augmentation of treatment resistant unipolar depression (TRD)". J Ment Health 19 (2): 168–75. ^ Ketter, TA; Manji HK; Post RM (October 2003). "Potential mechanisms of action of lamotrigine in the treatment of bipolar disorders". J Clin Psychopharmacol 23 (5): 168–75. ^ Braga, MF; Aroniadou-Anderjaska V; Post RM; Li H (March 2002). ". Lamotrigine reduces spontaneous and evoked GABAA receptor-mediated synaptic transmission in the basolateral amygdala: implications for its effects in seizure and affective disorders". Neuropharmacology 42 (4): 522–9. ^ Shiah, IS; Yatham LN; Gau YC; Baker GB (May 2003). "Potential mechanisms of action of lamotrigine in the treatment of bipolar disorders". Prog Neuropsychopharmacol Biol Psychiatry 27 (3): 419–23. ^ Ramsay RE, Pellock JM, Garnett WR, et al. (1991). "Pharmacokinetics and safety of lamotrigine (Lamictal) in patients with epilepsy". Epilepsy Res. 10 (2–3): 191–200. ^ Cohen, AF; Land GS; Breimer DD; Yuen WC; Winton C; Peck AW (Nov 1987). "Lamotrigine, a new anticonvulsant: pharmacokinetics in normal humans". Clin Pharmacol Ther 42 (5): 535–41. ^ Goa, KL; Ross SR; Chrisp P (Jul 1993). "A review of its pharmacological properties and clinical efficacy in epilepsy". Drugs 46 (1): 152–76. ^ Anderson, GD (May 1998). "A mechanistic approach to antiepileptic drug interactions.". Pharmacother 32 (5): 554–63. ^ a b In medicine, titration is the process of gradually adjusting the dose of a medication until optimal results are reached.